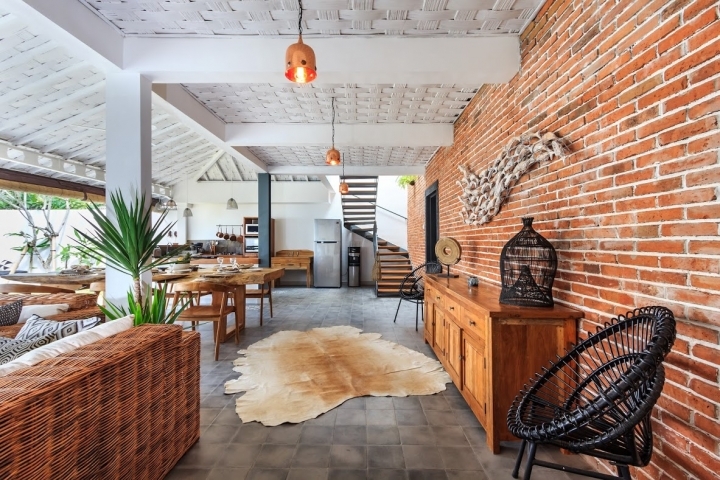 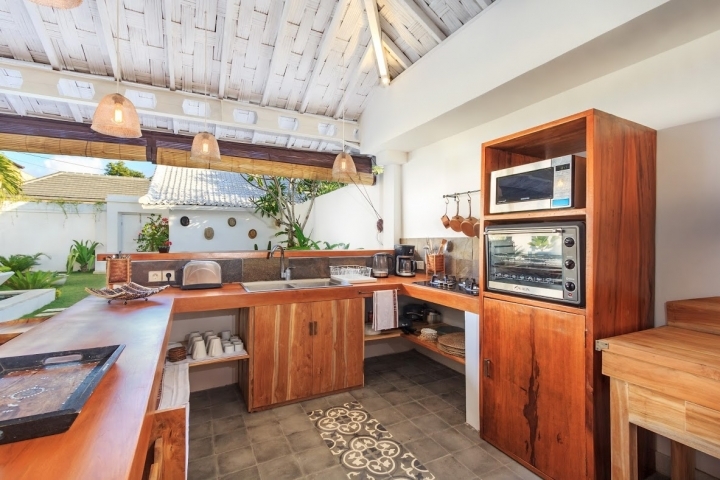 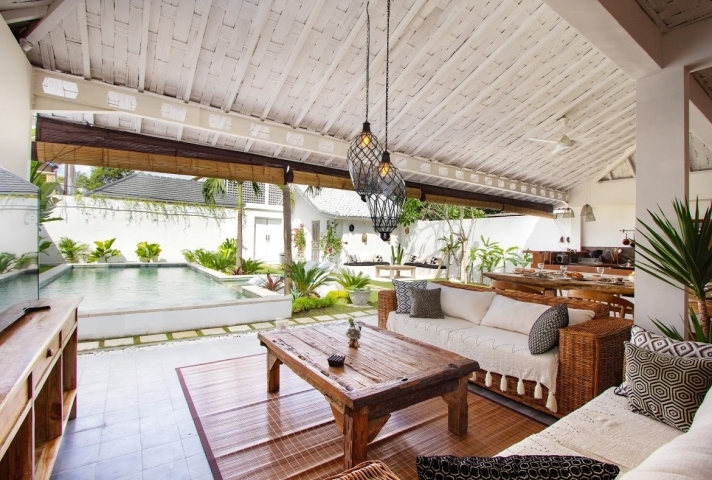 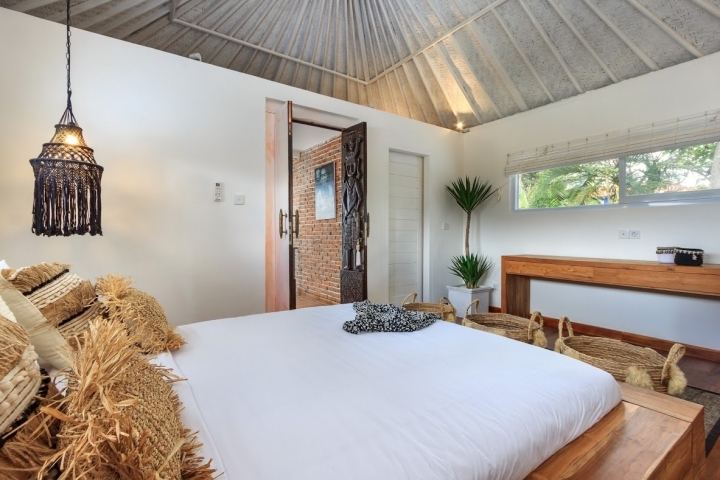 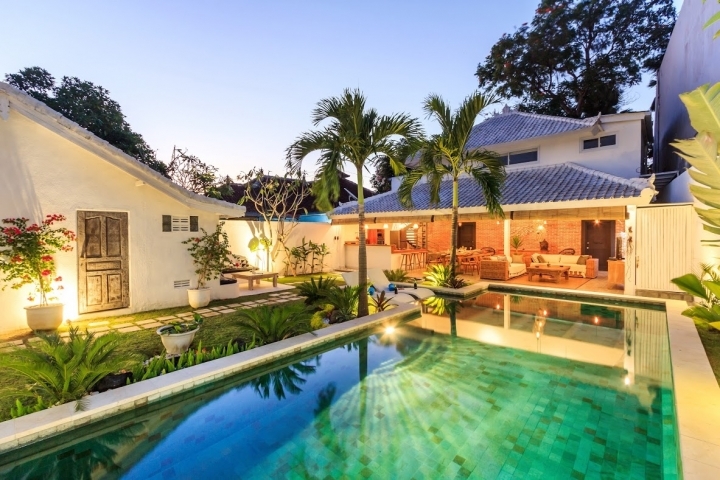 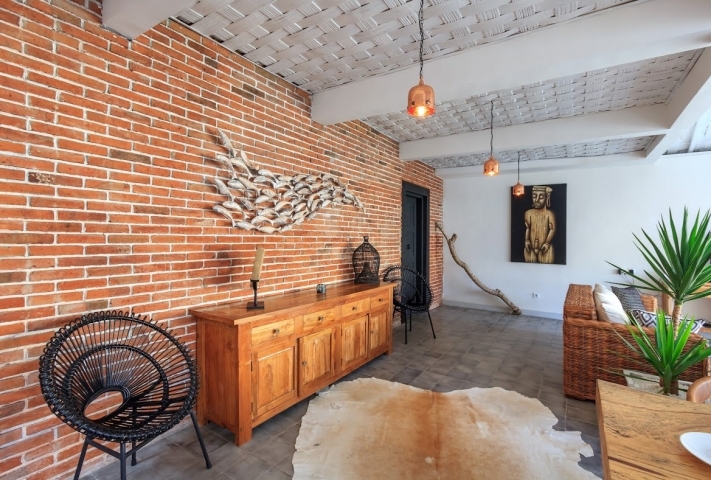 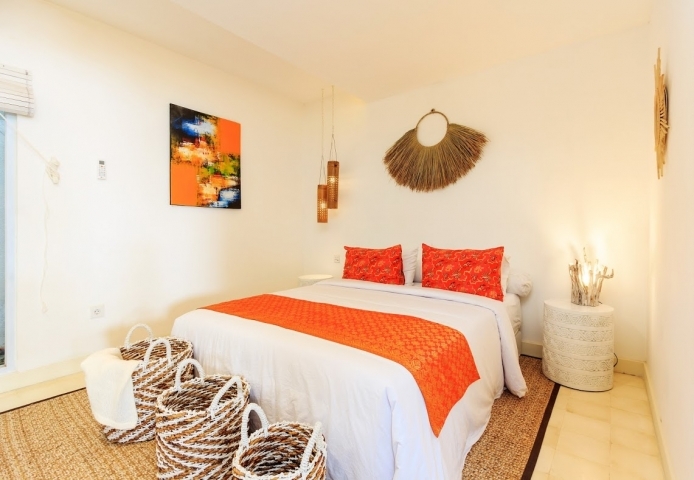 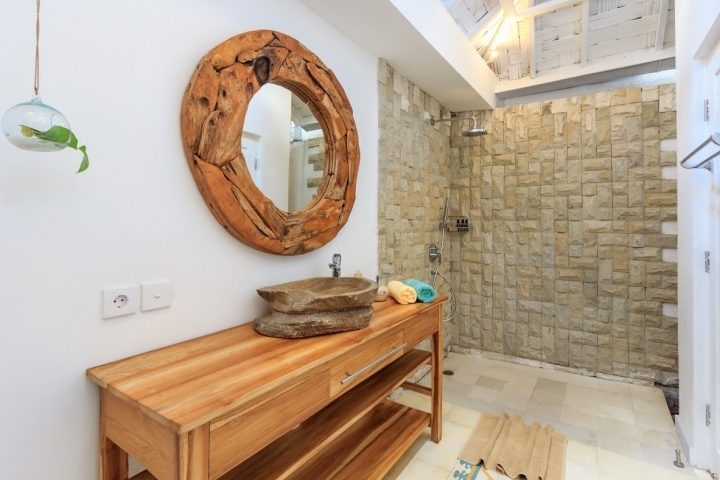 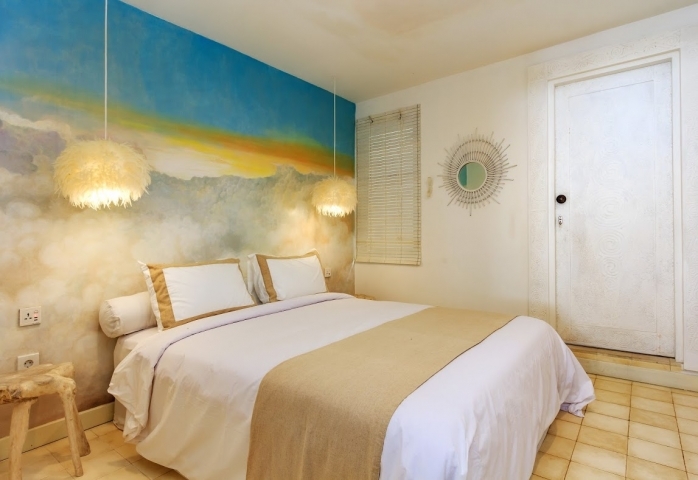 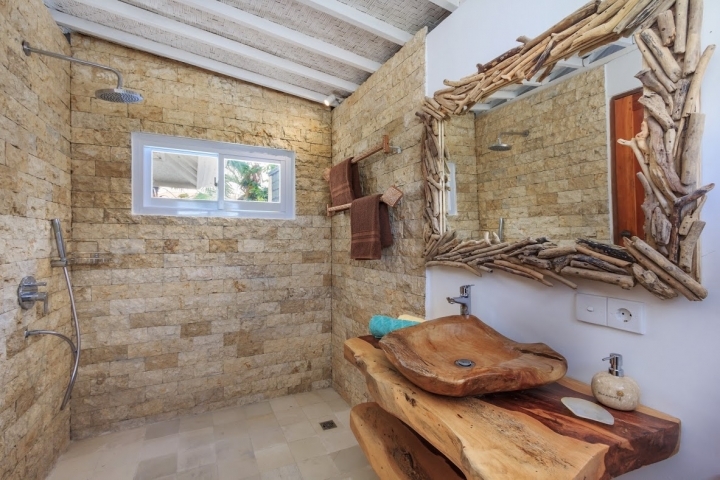 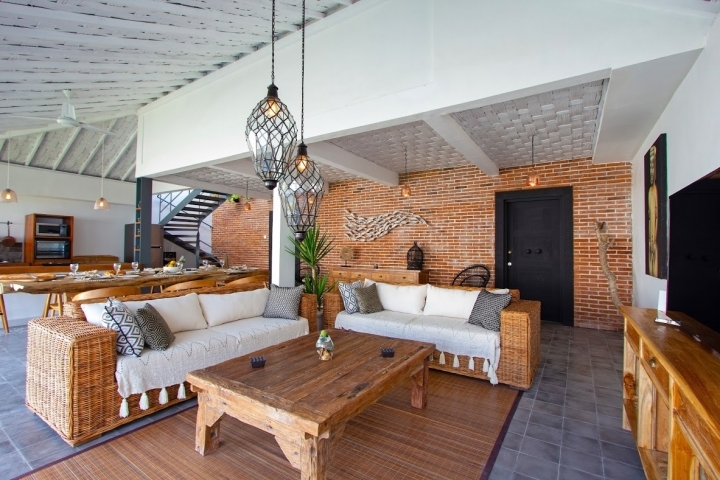 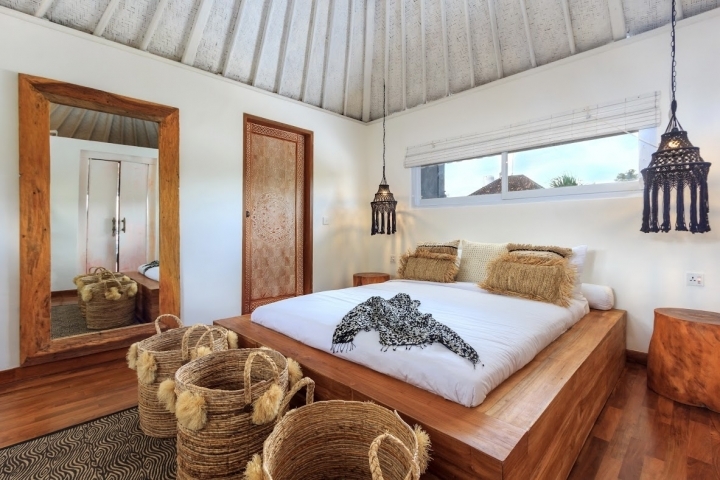 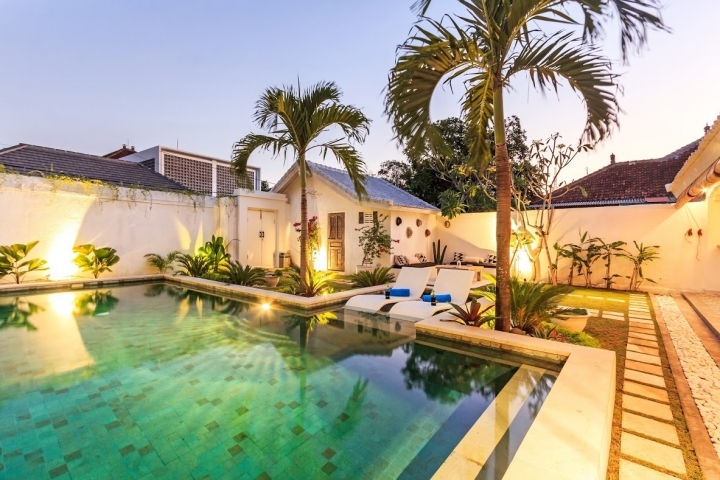 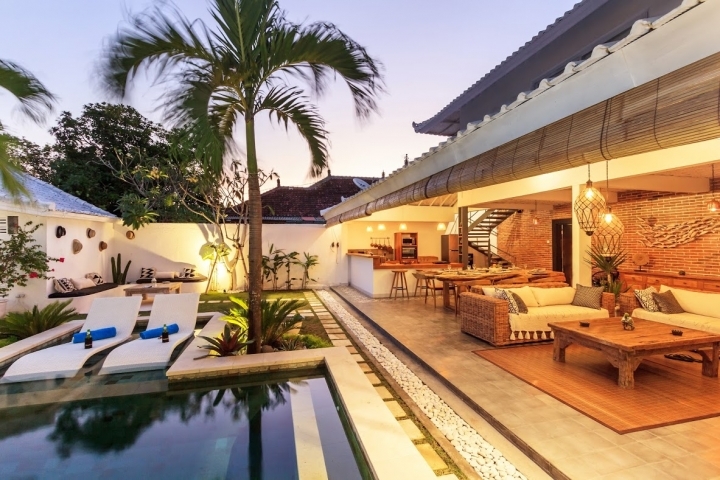 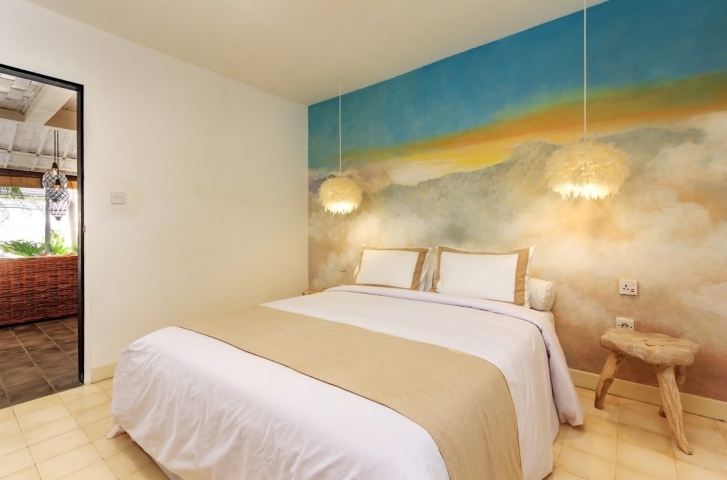 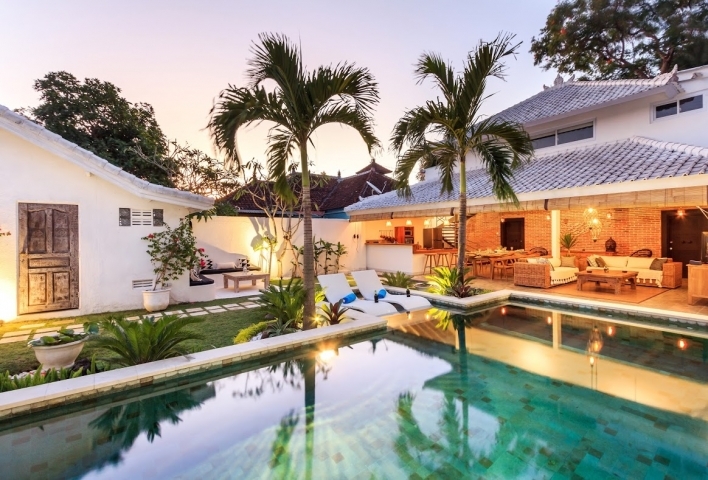 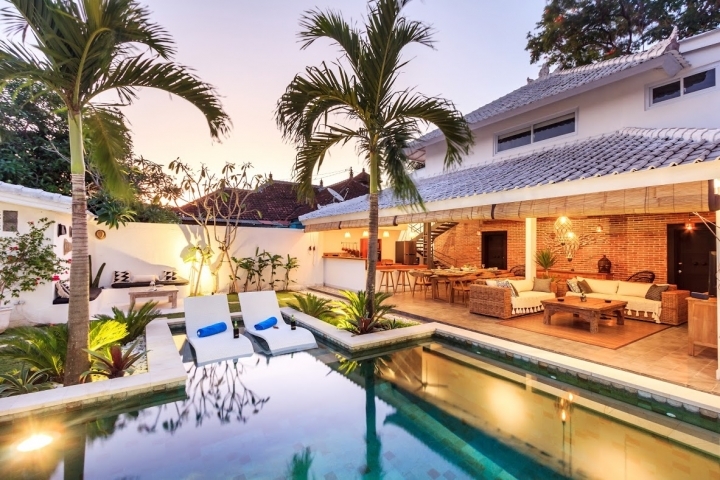 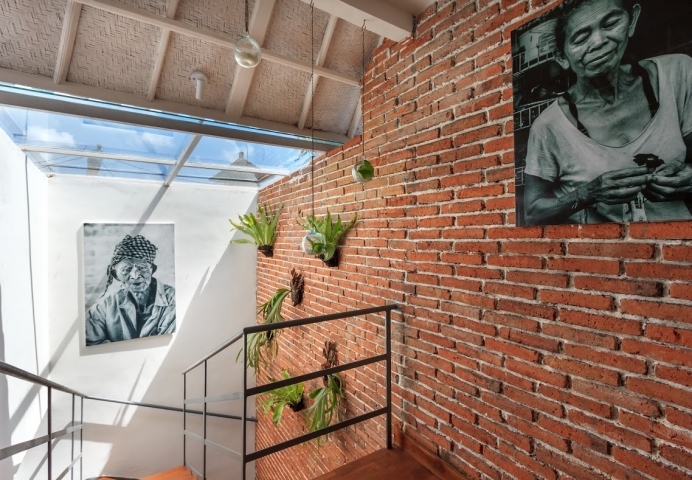 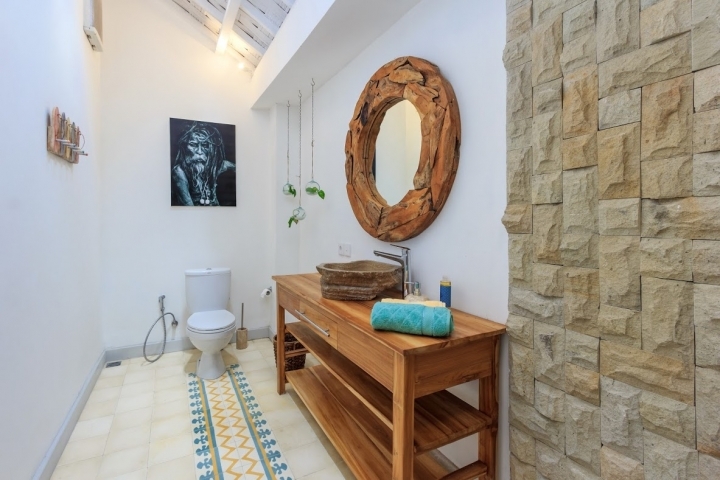 Tropical style 3 bedroom villa located right in the centre of Seminyak. 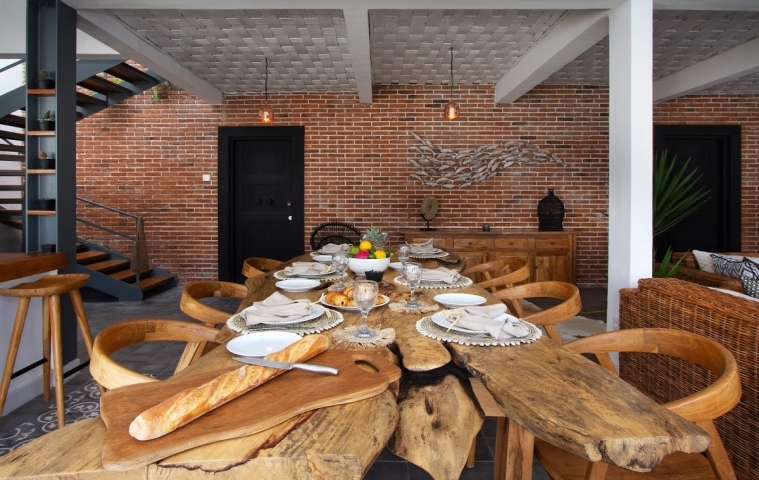 Villa combine traditional charm and French touch. 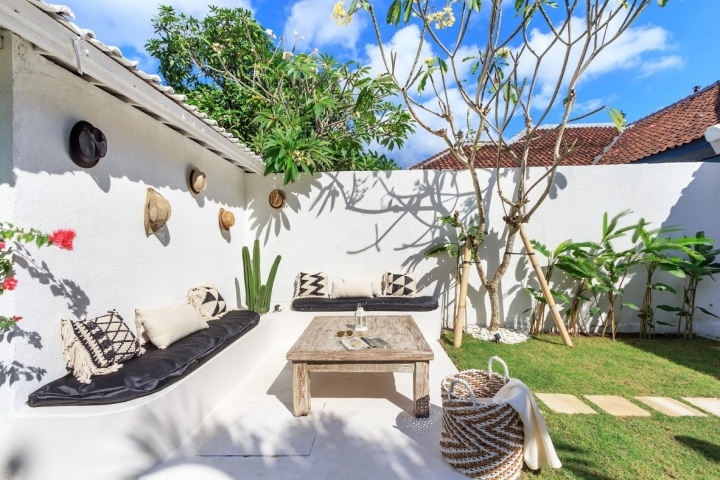 The beach is just a 15 minute stroll away and near to the villa, there are lots of shops, restaurants, cafes and spas to explore. 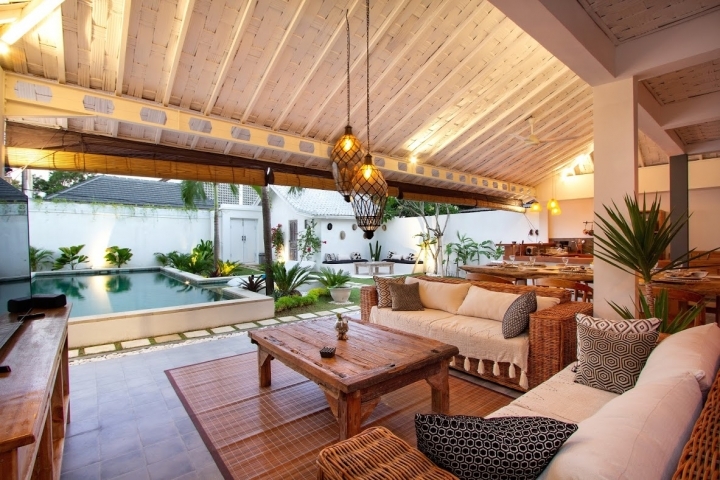 Villa makes a lovely vacation home for families or groups of friends. 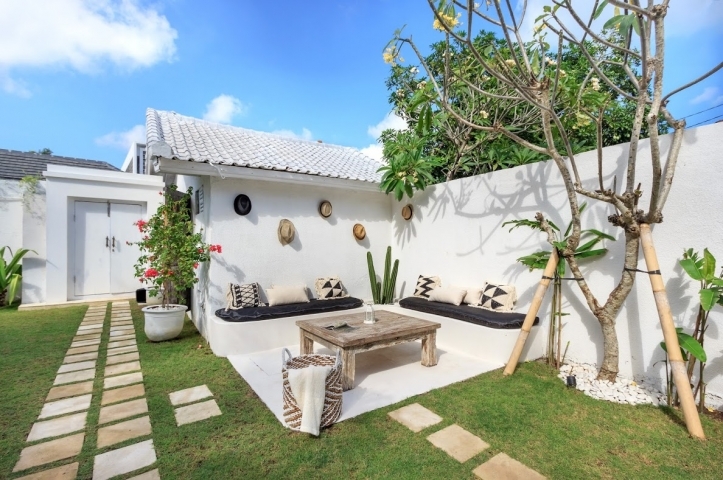 The garden is surrounded by white walls that reflect the sunlight in the daytime. 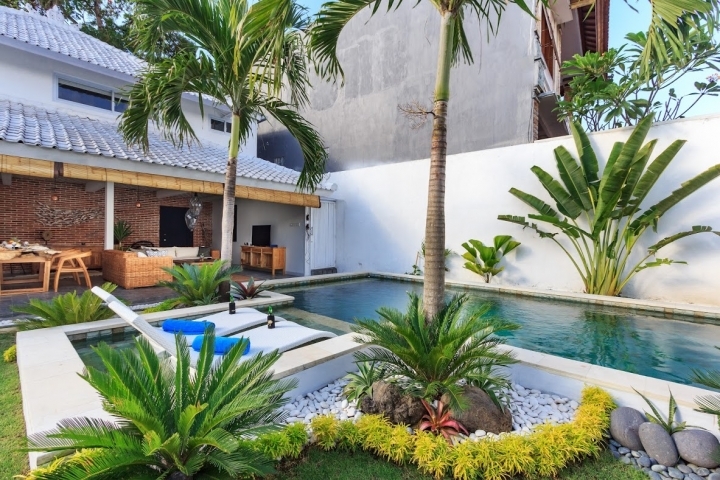 The pool looks most inviting with crystal clear water. 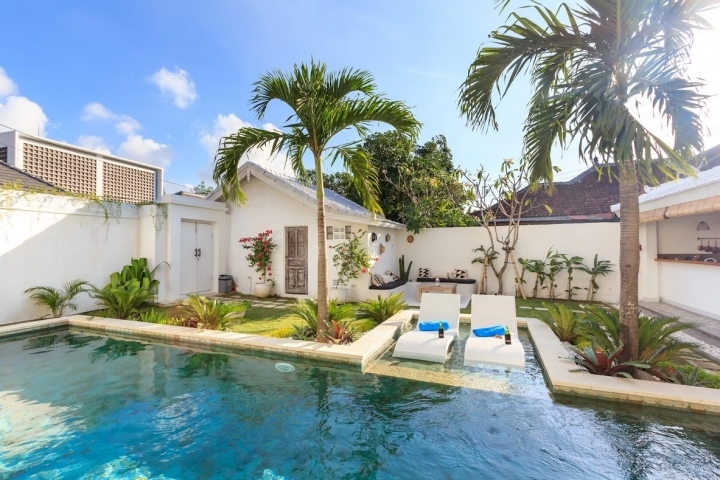 Two sun beds have been placed in the water of the pool. 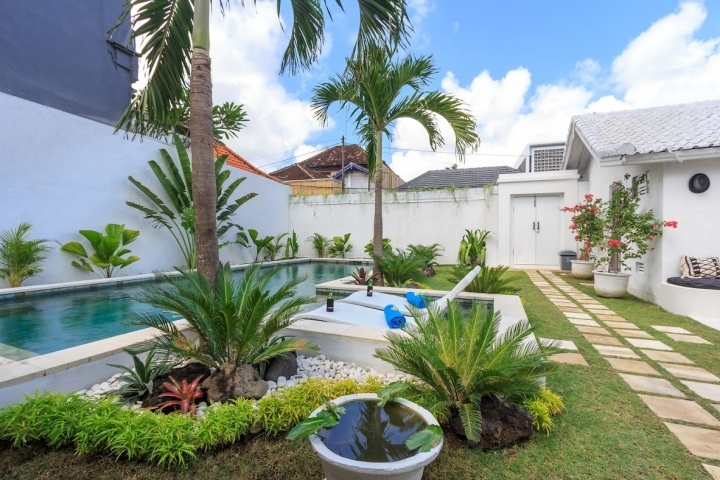 Alternatively, the shallow area makes a perfect little kids pool for families traveling with young children. 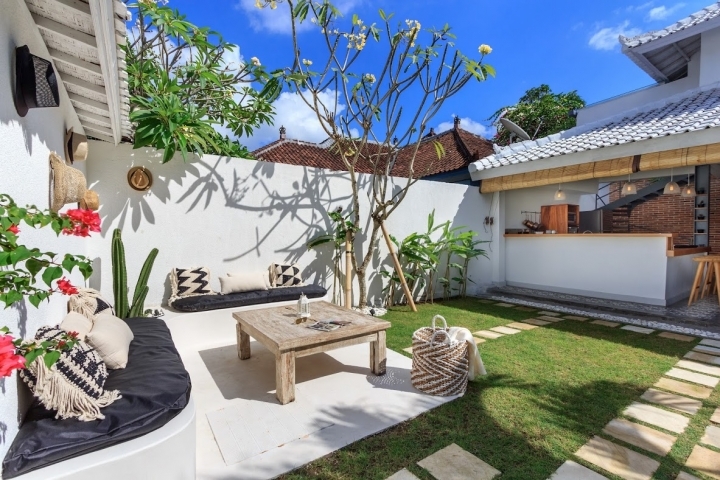 Stylish lounge corner is located in the corner of the garden, perfect for drinking cocktails or reading a book with a cup of coffee. 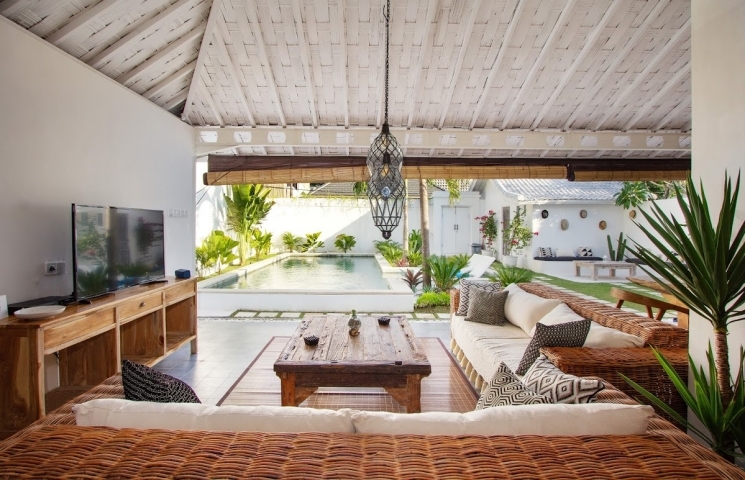 The living room is spacious and designed with beautiful furnishings and decorations. 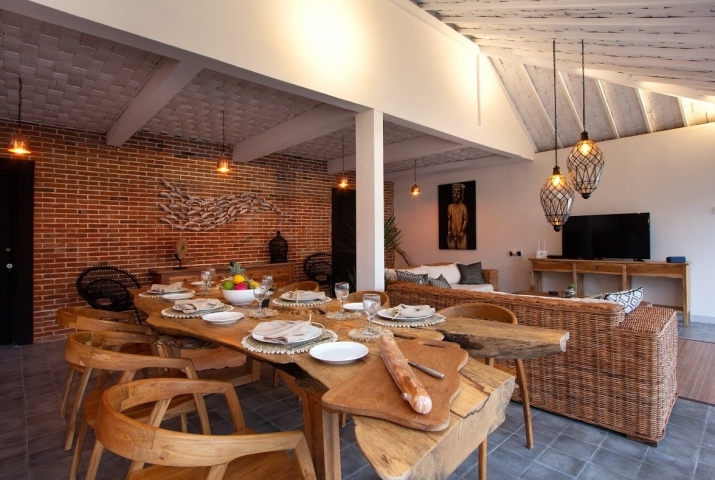 There are two rattan sofas, free-form wood dining table for 6 and kitchen comes with a bar and high chairs. 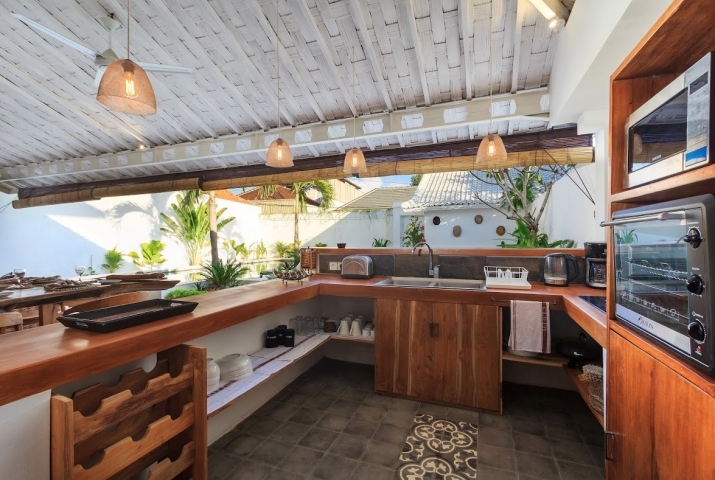 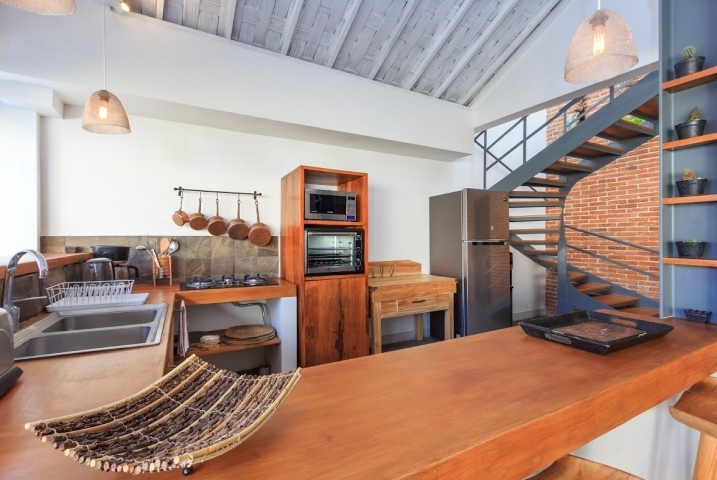 The kitchen is equipped with a stove, oven, microwave and all the kitchen utensils you may need. 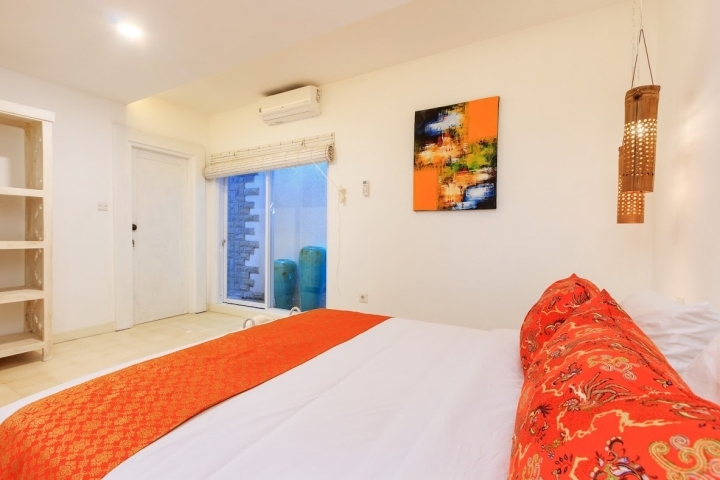 All 3 bedrooms are fully air-conditioned and equipped with a safety box. 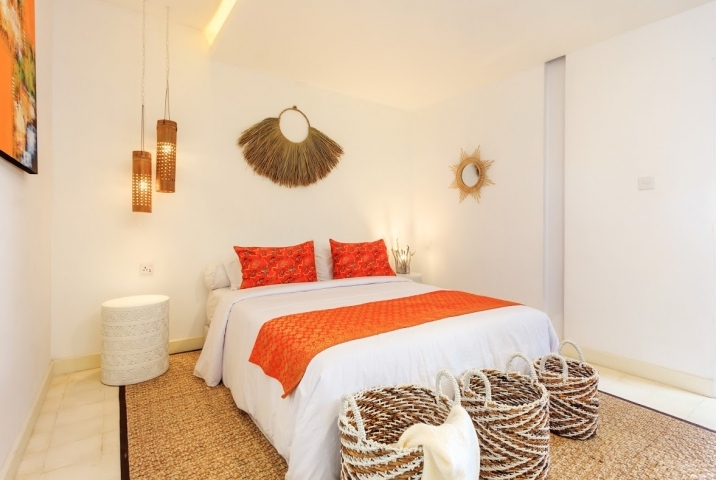 Every room with queen-size bed and each is adjoined by a private en-suite bathroom. 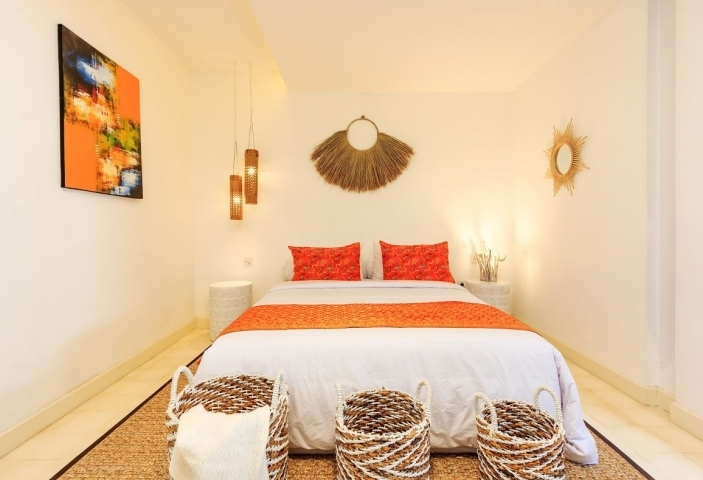 You can rent villa as 3 bedroom (Villa #704) or as 2 bedroom (Villa #2214). 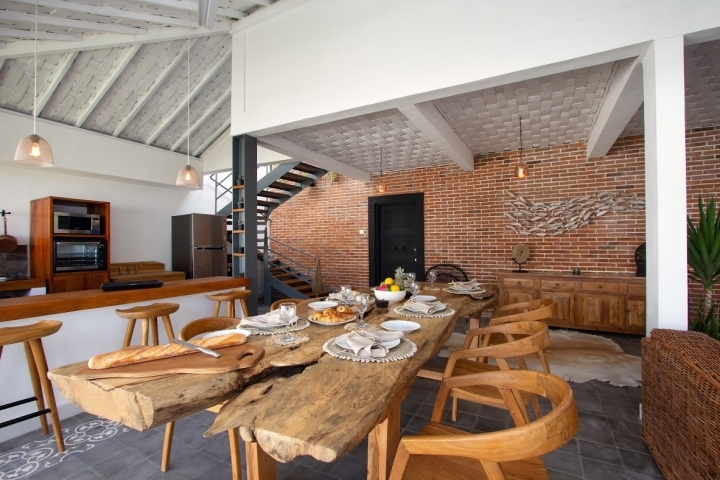 Middle Season: June, September. 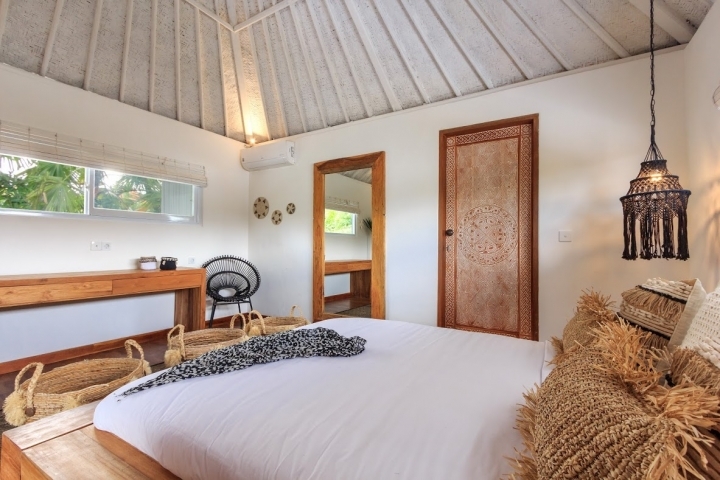 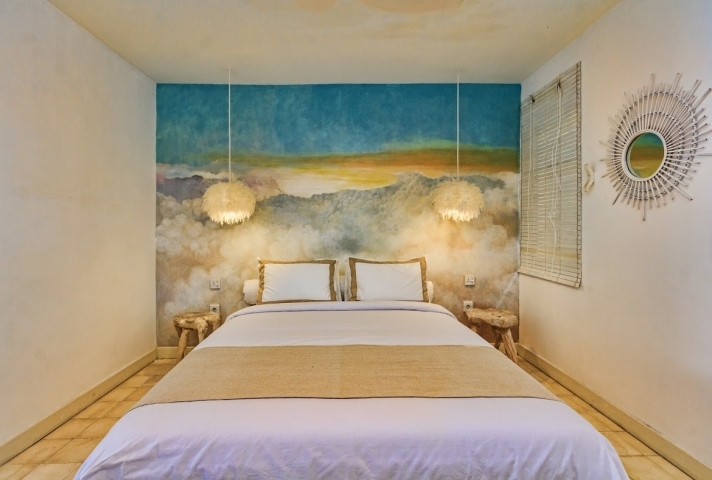 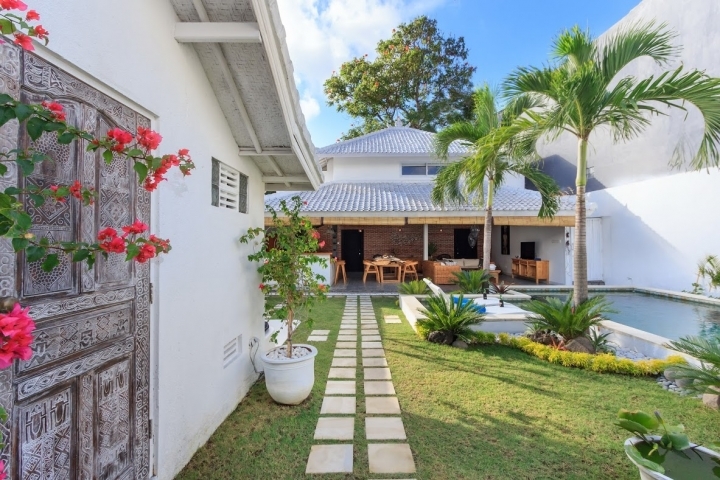 Price in Middle Season: 3 bedroom is $310 per night, 2 bedroom is $280 per night.